Candidates must attend a meeting, complete an application form and be interviewed. If eligible, the new member will be sworn in at our monthly meetings held on the first Sunday of each month. Dues are $24.00 per year. Members are requested to mail same to the attention of the Financial Secretary at the above address. 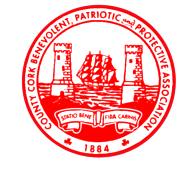 If you are moving or have moved recently, please remember to send a change of address card to the Cork Association at the address noted in the header above.